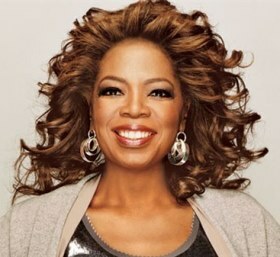 “Turn your wounds into wisdom” is a quote that seems to be attributed to US talk show host Oprah Winfrey (e.g. by BrainyQuote). While I haven’t been able to find the context in which Winfrey uttered these words, I would assume that one should learn from one’s personal setbacks in life. With any translation, a certain amount of meaning is lost. 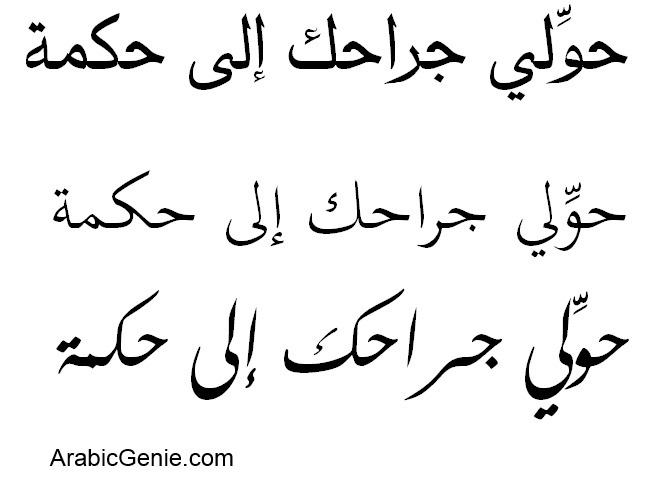 In this case, the alliteration of “wounds” and “wisdom” cannot be captured in the Arabic rendition. However, the sentence حوِّل جراحك إلى حكمة (Hawwil djaraHak ila Hikmah) captures the meaning of the original English phrase quite well in my estimation. It even contains a repetition of sounds, at least of sorts: the consonants Haa’ and kaaf are contained in both ‘djaraHak’ and ‘Hikma’. As with many tattoos in Arabic, you can choose whether or not you want to make the tattoo gender-specific. In this case the imperative “turn” would be different when addressing a woman or a man. Below are three Arabic tattoo designs for “Turn your wounds into wisdom” when addressing a man, followed by three designs when addressing a woman. 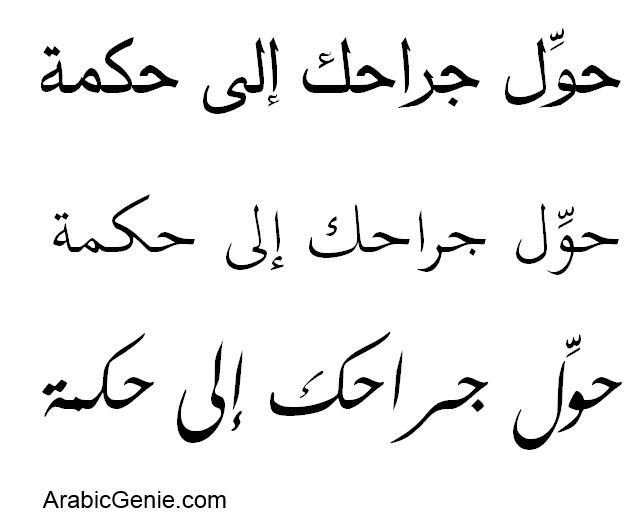 As you’ll notice, the only difference is one letter attached to the first Arabic word. The use of small diacritic marks here, is – in my view – preferable, as this makes it clear that the word is an imperative and not some other grammatical form. This entry was posted in Tattoos, Uncategorized and tagged oprah winfrey, tattoo, Translation, wisdom, wounds by ArabicGenie. Bookmark the permalink. Hi! I’m from Brazil and i really want to get one arabic tattoo. i think it’s beautiful and i love ther culture! Do you think it’s a good idea to tattoo it on my inside forearm? Your translation of it is rather accurate,but I think that you forgot to decline the second person pronoun in’جراحك’,which declines for gender and number.If the second person is masculine singular,you would say:’جراحكَ”jirahakA’,whereas if it’s feminine singular,you would say:’جراحكِ’ ‘jirahakI’. I want to have tattoo of my son’s name. 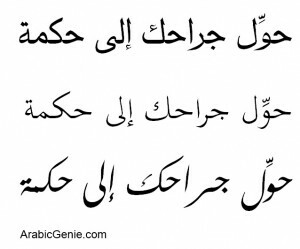 Please let me know the correct Arabic word for the same.